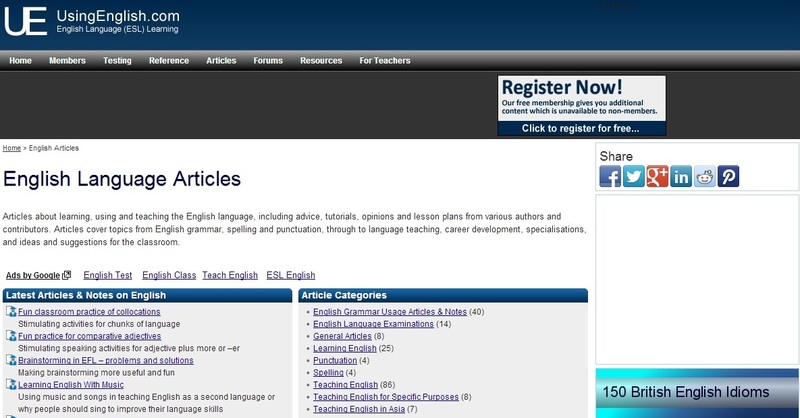 Using English is an important resource online with a large collection of English as a Second Language (ESL) tools & resources for students, teachers, learners and academics, covering the full spectrum of ESL, EFL, ESOL, and EAP subject areas. You can find tests and quizzes, handouts, printables, scientific articles, blogs and an interesting teachers forum. There's also a section that we found particularly interesting on English idioms and idiomatic expressions. Give it a try! You have read this article ELT / idioms / online resources / Students / teachers with the title English as a second language online. You can bookmark this page URL http://catolink4.blogspot.com/2012/11/english-as-second-language-online.html. Thanks! No comment for "English as a second language online"